Here is a latest news on 09.11.2016 that Haryana JBT Result 2016 had been announced. Here you can check HBSE DEd Result January 2016 1st 2nd 3rd 4th Semester Regular (Full subjects) & Reappear exams January 2016. Board of Secondary Education, Haryana (BSEH) had announced the result of Diploma in Education (D.Ed.) / JBT Exams on 26 April 2016. The board had taken 1st and 3rd semester regular and 1st 2nd 3rd 4th reappear exams in January 2016. Now the HBSE JBT results had been declared. You can check Haryana JBT Exam Result 2016 from below. 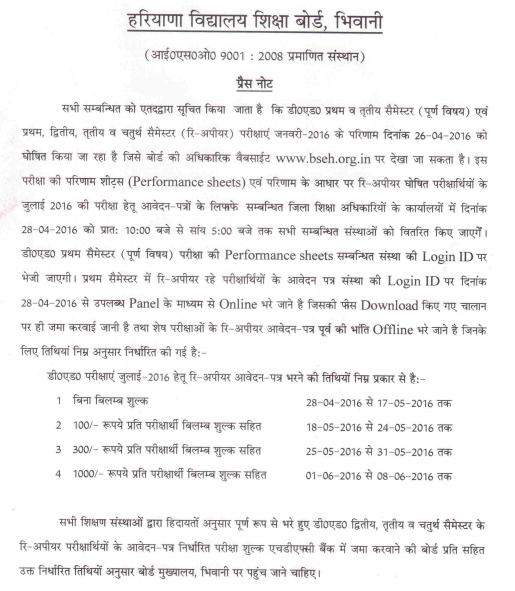 Performance sheets will be sent at login id of related institution. Those students who got reappear can apply online up to 17 May 2016.